Most of us view technology as something that makes things easier. For many people however, technology makes things possible. This is my story of designing ‘AT Magic’—a webapp that empowers Allied Health Professionals to provide better care for their clients. This project took place between March 2010 and December 2010. I worked on this project as an Interaction Designer for the Human‑Computer Interaction Lab, School of Computer Science and Engineering, University of NSW. I was part of a small team alongside Dr. Daniel Woo and James Salter. 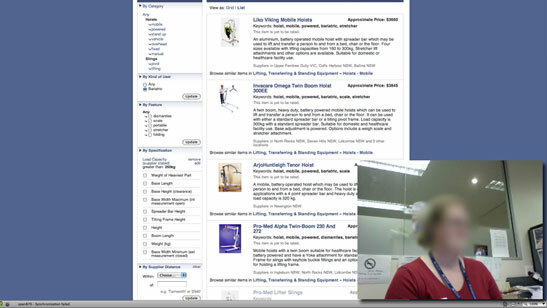 I was responsible for the research, interaction design, visual design, copywriting, branding and front‑end development for ‘AT Magic’—a web‑based application for ILC NSW's expansive AT product database. 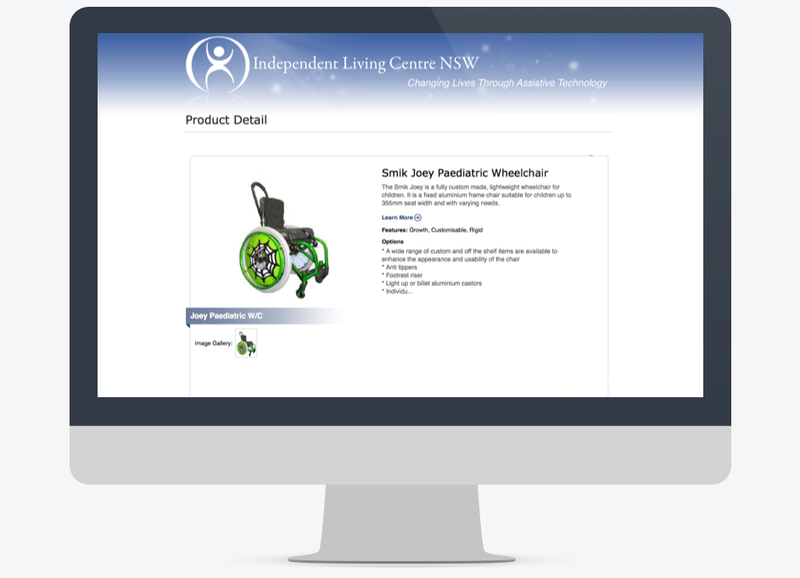 The Independent Living Centre (ILC) NSW approached us to help them excel in the provision of Assistive Technology (AT) information. This involved redesigning the ILC NSW website and envisioning how we could use the web to transform service delivery to Rural Allied Health Professionals (AHPs). With a 10 month timeline we focused on delivering the ILC NSW's AT database to AHPs in a more effective and meaningful way. Our lack of domain knowledge in allied health care meant we needed to understand the nature of health care service provision thoroughly and quickly. We approached all aspects of the project collaboratively and spent most of our time working on‑site alongside the ILC NSW team of AHPs. Throughout the project we conducted ethnographic research and used participatory design methods. This approach was necessary to understand the clinical reasoning process and the AT prescription process. To access our prospective users, we ran workshops at various health conferences. 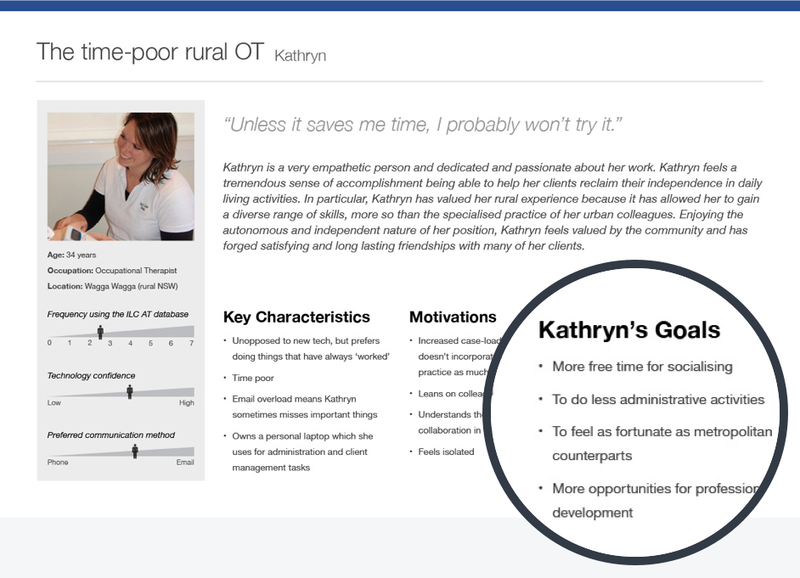 This allowed us to quickly understand the day-to-day challenges of rural AHPs. Because many rural AHPs were unable to attend the conferences, we developed a survey to understand AHP's access, usage and attitudes towards information and communications technology (ICT). For a more holistic understanding of the wider challenges faced by rural health professionals, I spent a lot of time buried in the academic research and literature. My research unexpectedly revealed that rural health practitioners felt they lacked access to educational resources and technical support for information and communication technologies (ICT). Insights from our discovery work indicated many areas where a web-based solution could help to improve the day-to-day lives of AHPs. 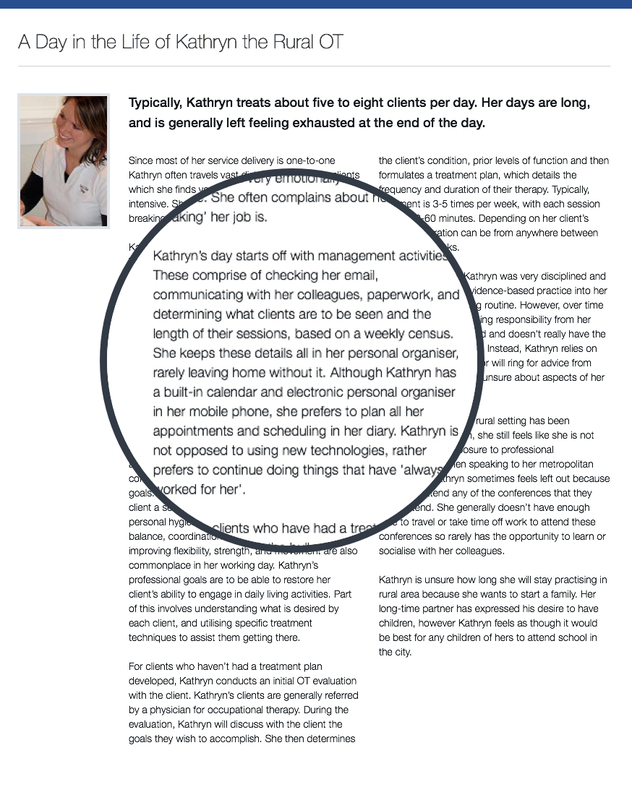 We discovered that whilst AT information was essential, it was only one dimension in providing effective care for clients. These insights began pointing to a web-based solution with the ILC NSW AT database at the core. Our vision was to create a collaborative environment that allowed AHPs to evaluate the benefits and limitations of different types of AT. With the AT database at the heart, we envisioned an evidence-based review and discussion system that allowed AHPs to share their experiences and learn from each other. Although our vision was to create an environment for a community of AHPs, we discovered that there were too many obstacles that impacted our development timelines to tackle the problem. Our research highlighted that it was critical for our design to be pragmatic and sensitive to the ways in which AHPs worked. We knew that if our solution required heavy time investment from AHPs or didn't provide an easily perceived tangible benefit, it would fail. For our rural audience we needed to develop a solution that worked effectively on low-bandwidth connections. 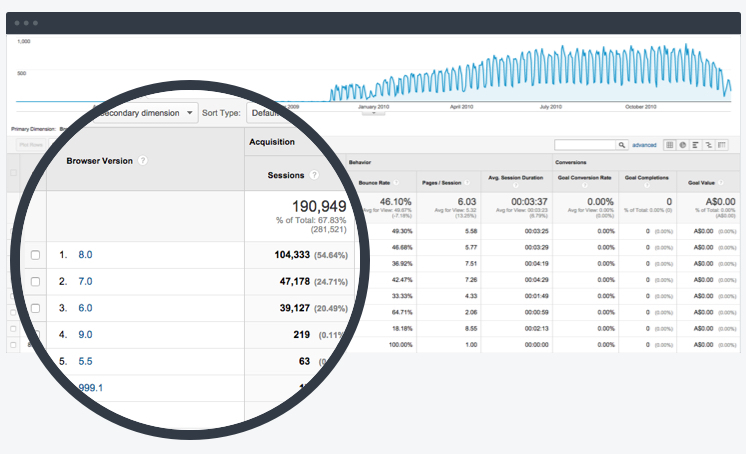 Website analytics also revealed that 20% of the traffic browsed the ILC NSW website using Internet Explorer 6. We embraced these constraints from the outset and opted to strive for a simpler and accessible solution. 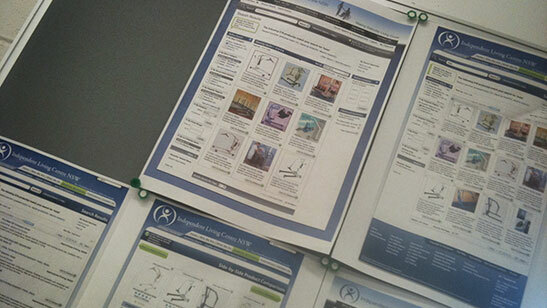 Before starting any design, we spent a great deal of time making sense of workflows and existing content. This involved a tonne of task analysis and card sorting work. We faced particular challenges with labelling and terminology as we found that language varied between health disciplines and older and younger generations of AHPs. Mapping out the workflows was also challenging as health care involves many different touch‑points with many different people. This Hierarchical Task Analysis map shows the process of an experienced occupational therapist identifying and sourcing assistive technology through the government funded PADP source. In order to help understand many of the complex processes involved in choosing and prescribing AT, I mapped workflows on paper. Doing so helped me to understand the particular points where our system could help minimise some of the pain AHPs experienced as well as highlight opportunities where we could really try to innovate. 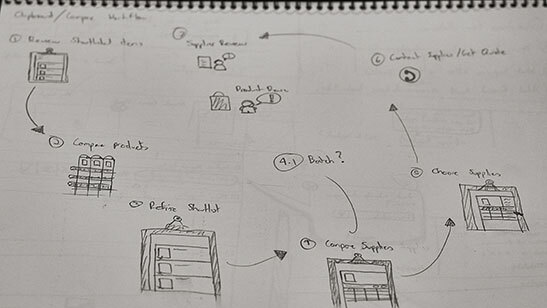 Instead of wireframing, I opted to sketch my designs on paper. I used paper prototyping techniques to bring the designs to life and evaluate them with our users. This helped me work rapidly and led me to consider more ideas. Sketching many concepts helped me form a broader view of the system earlier ensuring a more cohesive design. To move forward with the design I used Photoshop to create sets of detailed mockups. This approach was beneficial in showing our stakeholders design progress, but was too time consuming to iterate at the pace required. In retrospect, Samantha Warren's Style Tiles system would have been effective. 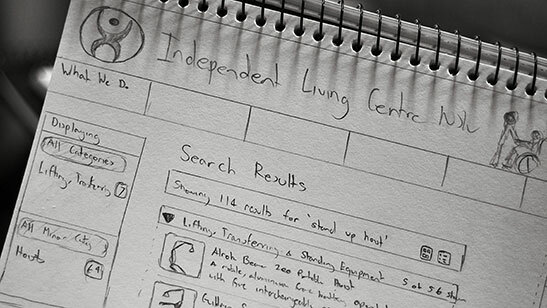 I worked closely with our developer James to bring our designs to life as a working prototype. Communicating requirements face-to-face and discussing constraints and possibilities was an effective way of solving the Interaction Design. We were worked collaboratively, tested constantly and iterated progressively. 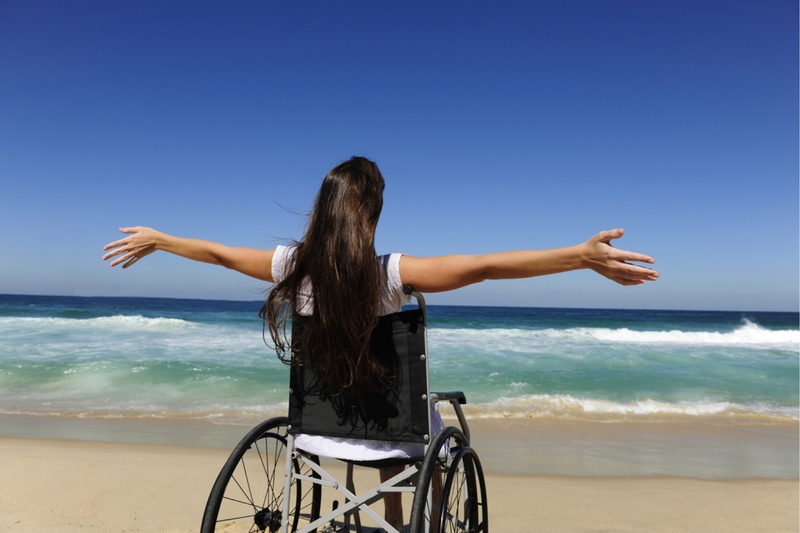 AT Magic is a web-based tool that assists allied health professionals in finding the right assistive technology for their client’s needs. 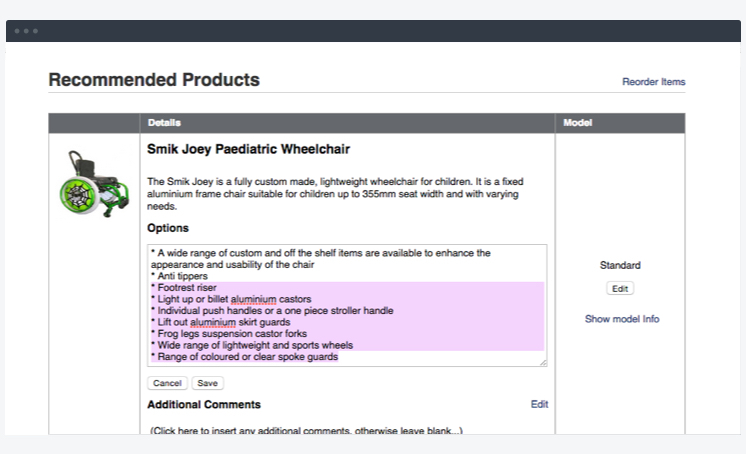 Users can enter keywords and criteria based on characteristics important to their client's clinical scenario and filter the thousands of AT products on the ILC NSW database. 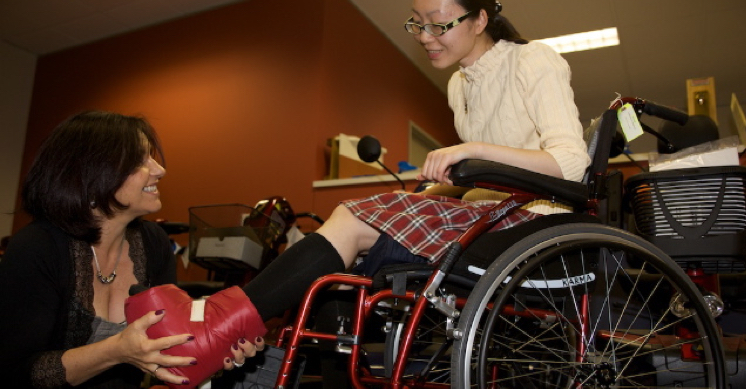 We developed the search to accommodate AHPs difference in experience and use of terminology. 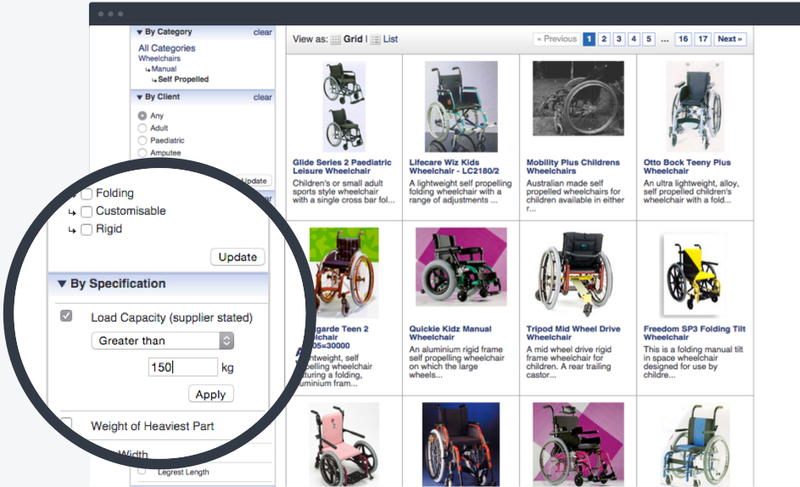 The AT Magic product search allows the user to start off with a simple keyword representing a particular item e.g 'Wheelchair' or a multitude of items e.g 'Hygiene'. 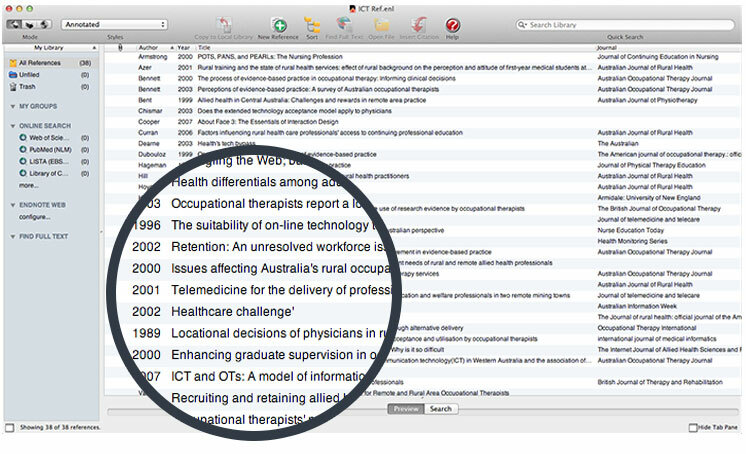 If the user searches for a particular piece of AT, the search will return results of related AT that the AHP should also consider prescribing. The filters or ‘facets’ encourage users to step through a clinical reasoning process to ensure careful deliberation is given to both the clients' needs and specifications of the AT. Our design understands the highly contextual nature of AT selection criteria and thus gives the user complete flexibility to choose facets. 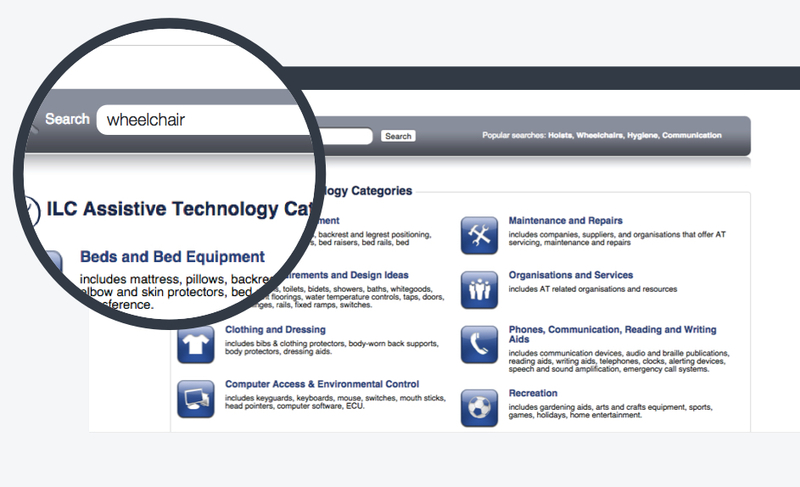 The design of the search filters supports the understanding that knowing the precise details of the AT is just as critical for clients as finding the correct type of AT. To help rural AHPs with continuing professional education, we worked with the ILC to produce educational modules and podcasts. The modules are online streaming videos that can be used as an educational reference by students, new graduates and experienced health professionals. They cover different aspects of AT and range from introductory content to in-depth clinical reasoning strategies. 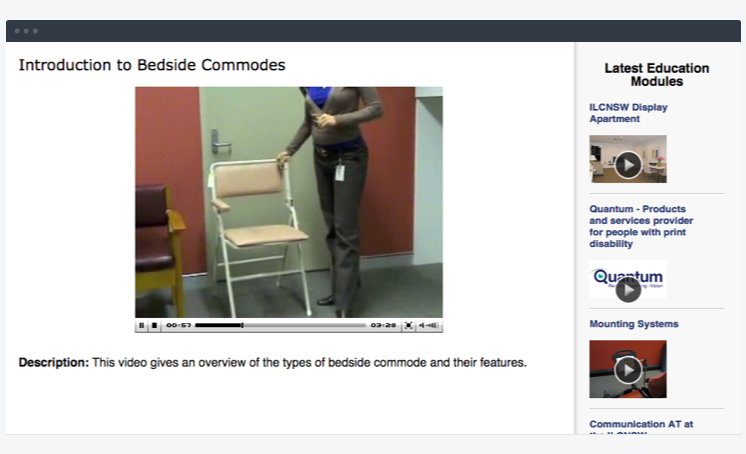 Educational modules combine slides, audio commentary and video demonstrations. AHPs can create an ‘AT Recommendation’ to hand-out to clients, attach with equipment request funding forms or keep for their own professional records. This feature aims to take the pain out of manually creating documentation by offering a completely customisable method that's always accessible through AT Magic. We knew that AHPs like working with paper and physical filing, so we designed accordingly.